The program’s addiction focus and treatment approach. Program quality of care and ability to treat multiple conditions. Who Answers? to speak with a caring recovery advisor about the rehab facility options that will best suit your needs. Question #1: What Kind of Treatment Structure Do You Need? Individuals with the most severe or complicated addictions that may involve additional medical needs tend to do best in inpatient programs, where the body’s substance detoxification process can be carefully monitored 24/7. Outpatient programs tend to be better suited to individuals with less severe addictions, where 24/7 monitoring is not as critical. 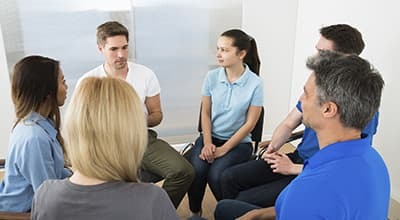 Individuals who are already in a treatment program or who have already completed inpatient or outpatient programs often do well in support recovery groups, where they can continue their ongoing recovery process. While this site serves as a basic guide on various treatment structures, your first priority should be to see a treatment professional who can properly perform a full assessment for you. You will then be better advised as to what program will be best for you, based on the severity of your addiction and also on your particular life circumstances. Inpatient drug or alcohol treatment (also called residential treatment) removes you from your everyday environment to focus entirely on addiction recovery. It is also recommended if you’ve tried rehab in the past and relapsed. Inpatient rehab typically involves a period of detox – a process during which the body is able to clear itself of any remaining drugs or alcohol. Inpatient treatment can involve various lengths of stay and may occur in a hospital setting when the most intensive treatment is needed. All inpatient programs involve living in a sober setting and attending group and individual therapy sessions. 30-day programs are one of the most common extended-stay recovery programs. They involve a shorter time commitment and tend to be most effective if you are in the earlier stages of drug or alcohol addiction. 60-day programs are a longer version of the 30-day program. They help to foster a better relationship with your therapist, ease you into a more stabilized sober body and mind and build up support networks with others in recovery. 90-day programs keep you in a sober living environment for an extended period of time. This program provides more time for you to develop recovery and prevention skills. Outpatient treatment allows you to work on your recovery from home, while maintaining focused, but without around-the-clock care. This type of treatment can be very beneficial with less severe cases of substance abuse. Intense outpatient treatment and partial hospitalization is also available for providing more frequent or lengthier periods of treatment. Typically, more long-standing cases of substance dependency are better addressed by more structure residential or inpatient programs. If you’re severely addicted to a substance you won’t find this type of treatment as effective as other inpatient options. Are low-cost (free) options for addiction recovery and should be considered alongside other treatment programs. Follow a spiritual route to recovery. Begin with admitting powerless over your addiction as you embark on a new way of living and lifelong process of recovery. Provide a great sense of community for many. Question #2: Does the Program Specialize in Your Addiction? Every abused substance has its own type of withdrawal and recovery process, and it can be helpful to find a program that specializes in treating your particular addiction. Recovering from alcohol addiction, for example, will involve a very different detox phase and treatment plan than recovery from stimulant addiction. While many rehab centers address general substance abuse and addiction, enrolling in a program with experience treating abuse of particular substances will better address your recovery needs. Question #3: What Kind of Treatment Approach Is Offered? Different rehab centers will offer various types of treatment based on their own recovery philosophies. For example, some may adhere to a harm-reduction approach to long-term recovery. This can include a mediation-assisted recovery to help a person through withdrawal and beyond, if necessary. Others will require individuals to abstain from drugs or alcohol entirely. Takes the individual through 12 predetermined steps toward recovery, with a spiritual (not religious) emphasis on making amends. Recognizes thoughts about alcohol and drugs, develops refusal skills and attempts to avoid potential relapse situations. Emphasizes internal motivation to change and works to increase personal responsibility. Implements treatments that have been researched and shown to be effective in recovery. Uses the earning of incentives, such as prizes for meeting goals, in treatment. Focuses on learning new coping behaviors, making better choices and relying on a support network. Reduces the stress of early recovery through relaxation activities (such as yoga, meditation, music therapy and art therapy). Involves relapse-prevention groups, education groups, social-support groups, individual counseling and urine and breath testing over a 16-week period (intensive outpatient). Another aspect of treatment to consider is family involvement. Some programs encourage heavy family involvement in the recovery process. So think about how much you want your family engaged in your treatment, and choose a rehab program that fits your requirements. 50% to 70% of patients receiving treatment for substance abuse also have a mental disorder. In addition, if you or a loved one is struggling with mental illness and substance use problems it is called dual diagnosis (also called co-occurring disorders). Mental health disorders commonly occur with substance abuse disorders. In fact, 50% to 70% of patients receiving treatment for substance abuse also have a mental disorder. There are programs aimed directly at addressing dual diagnosis, with specialized treatment plans to account for each recovery process. Question #4: Does the Program Offer Aftercare? The best treatment programs will offer some sort of support and planning following completion of the initial program. Recovery is an ongoing process that continues after you leave a treatment program. Once the initial treatment program is completed and day-to-day living resumed, many people find it difficult to maintain abstinence on their own. The best treatment programs will offer some sort of aftercare following completion of the initial program. Group therapy: Engaging with a group of recovery support peers. Counseling: Continuing counseling sessions, including emergency crisis counseling when you are facing particular struggles against relapse. Relapse prevention: Increasing your sense of self-efficacy (maintaining a “can-do” state of mind). Cognitive therapy: Addressing and confronting the underlying thoughts, behaviors and beliefs that led to the abuse or addiction, as well as developing the skills to avoid relapse. Emotional regulation: Learning to control negative emotional responses and compulsive tendencies. Question #5: Is the Program Accredited and Are the Staff Certified? Accredited treatment programs are held to a particular standard of operation, care and treatment. These standards can vary by state and adhere to quality management and care, including addressing client rights, effectiveness and safety. Without accreditation, there is no guarantee that the program will offer proper treatment or care quality. For information on accreditation in your state, check the National Review of State Alcohol and Drug Treatment Programs by the Department of Health and Human Services. To find out what certifications and licenses your state requires of your counselors, visit the Addiction Technology Transfer Center Network. Question #6: Does the Program Offer Individualized Treatment Plans? A treatment plan is like a road map that you will follow through the stages of substance abuse and addiction recovery. Matching a treatment plan to an individual’s needs is a vital part of effective substance abuse treatment and has the best recovery outcomes. The most effective treatment plans are tailored to you and your needs by a team of credentialed providers. Because your needs will change throughout treatment and recovery, following an adaptable treatment plan will benefit you the most. Question #7: Is the Program Style Non-confrontational? Non-confrontational programs are more likely to help a person working to recover from substance abuse. These programs involve empathy-focused reflective listening, working with the patients and their needs. For help finding a program, call 1-888-319-2606 Who Answers? to speak with a treatment support specialist. Question #8: What is the Staff-to-Patient Ratio? A facility’s staff-to-patient ratio is the number of staff members compared to the number of patients. The higher this ratio (meaning more staff members per patient), the more personalized care the facility can offer. Ideally, all rehab facilities would have one-on-one care, meaning one counselor for every patient – but this is often not the case. However, you can still find great, personalized treatment programs with a high staff-to-patient ratio if you believe that more focused and personalized guidance will provide you with the most benefit. Question #9: How Much Does It Cost? Rehab program prices can vary depending on the type of program, and program cost can often determine what type of care a person may seek. Keep in mind that any structured treatment program is better than no program at all. Inpatient treatment will be more expensive than outpatient treatment because the price must account for all living costs, including meals and facility accommodations. Other self-help programs such as Alcoholics Anonymous and sober houses offer a much more affordable recovery if you’re struggling with financial difficulties or without insurance. No matter what your insurance or financial situation is, call us at 1-888-319-2606 Who Answers? , and we can help you find the right program that fits your needs. Don’t be discouraged if treatment centers fall outside of your price range. Many effective, affordable options are available. Medicaid, Medicare and other types of health insurance now cover screening for substance abuse; however, coverage does not always include treatment. Marketplace (government-organized) insurance plans cover substance abuse treatment to varying degrees, depending on which state you live in. Visit the Health Insurance Marketplace to find out what kind of coverage your state offers. If you have private insurance, call your insurance organization to find out what types of substance abuse treatment are covered by your plan. If you do not have any insurance, consider enrolling in a lower-cost stabilization program or a free self-help program. Question #10: Where Is the Program Located? Location is an important and often overlooked aspect of recovery treatment. Not only does the decision of either outpatient or inpatient treatment matter, but the actual geographic location where you choose to recover can make a huge difference. Some people find a strong support system in their friends and family and will want to be closer to these important positive influences. Others find that taking a break or avoiding the original abuse environment, friends and all, offers them the clearest path to recovery. You may find that there are no accredited programs or facilities near you, or that the ones that are nearby do not meet your recovery needs. Because recovery is the number one concern, you may want to at least temporarily relocate to be closer to a recovery center that is well-suited to you and your circumstances. If you are not sure how to find a program near you, call us at 1-888-319-2606 Who Answers? to speak to a caring recovery advisor about your options. Check out what our community members are saying about drug and alcohol rehab programs at our online forum. 1. Kissin, W., McLeod, C., & McKay, J. (2003). The longitudinal relationship between self-help group attendance and course of recovery. Evaluation and Program Planning, 26. 311-323. 2. Center for Substance Abuse Treatment. (2005). Substance abuse treatment for persons with co-occurring disorders (DHHS Publication No. SMA 05-3992). Rockland, MD: Substance Abuse and Mental Health Services Administration. 3. Moos, R. H., & Moos, B. S. (2003). Long-term influence of duration and intensity of treatment on previously untreated individuals with alcohol use disorders. Addiction, 98, 325-337. 4. Friedmann, P. D., Hendrickson, J. C., Gerstein, D. R., & Zhang, Z. (2004). The effect of matching comprehensive services to patients’ needs on drug use improvement in addiction treatment. Addiction, 99(8), 962-972. 5. Miller, W. R., & Wilbourne, P. L. (2002). Mesa grande: A methodological analysis of clinical trials of treatments for alcohol use disorders. Addiction, 97, 265-277. 6. White, W. L., & Miller, W. R. (2007). The use of confrontation in addiction treatment: History, science, and time for a change. The Counselor, 8, 12-30. 7. Barnett, P. G. & Swindle, R. W. (1997). Cost-effectiveness of inpatient substance abuse treatment. Health Services Research, 32(5). 615-629.